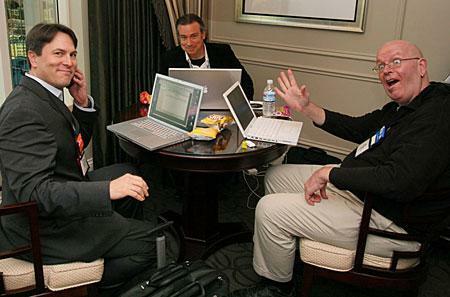 At the end of every CES, we struggle to find the underlying themes that bind the show to the industry and the world at large. 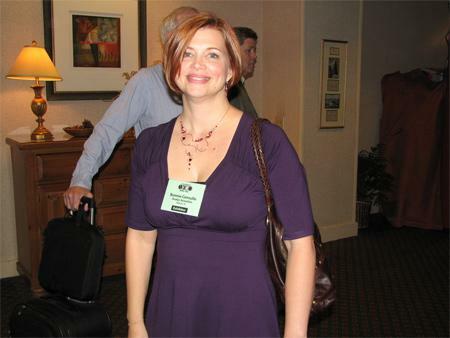 The overwhelming theme this year was the economy. Attendance was downthe official estimate was 10% off of last year's, but everyone I spoke with snorted in derision at that figure. 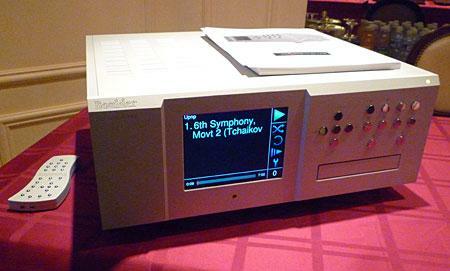 I'm still amazed at the sheer number of new high-end CD players announced at this show. Either someone didn't get the memo about the disc format's impending demise, or else we've entered that phase, as with turntables, that playback advances will continue to win new customers with big collections. 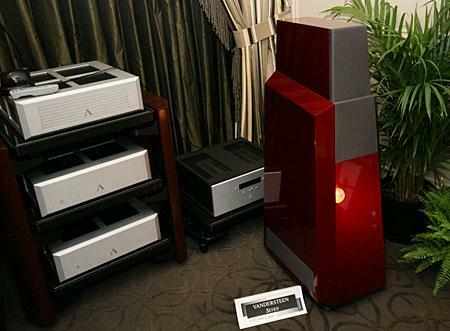 Although it was shown in protype form at the 2008 CES, the Giya from South African manufacturer Vivid ($58,000/pair) is now in production and was being demmed in US distributor On A Higher Note's penthouse suite at the Mirage hotel with Luxman amplification, Nordost Odin cabling, Quantum power conditioning, and open-reel tapes from The Tape Project's second batch of releases played back on a Tim de Paravicini-modified Technics deck. JA caught up with me at the Blue Light Audio room and suggested we saunter down to hear the 25Wpc Audio Note Ongaku integrated amplifier ($95,000) featured in his photograph above. Yes that's a jaw-dropping price, even after four days of CES. The Ongaku has five line level inputs. 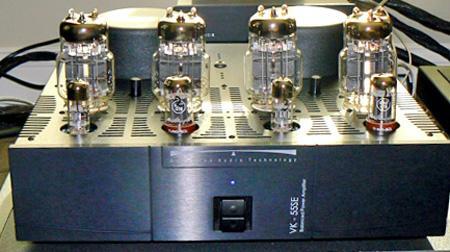 It employs two NOS VT4-C (211) tubes, an original NOS Telefunken 6463, and two NOS 5R4WGB rectifiers. 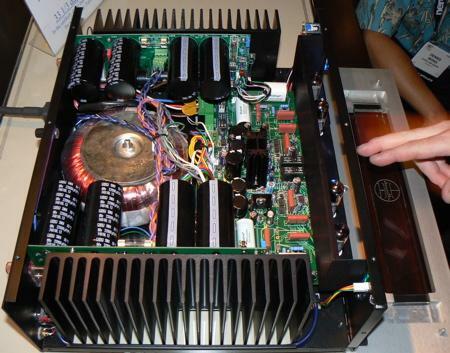 Audio Note builds it own silver-wired driver transformer on a double AN-Perma nickel C-core. AN tantalum resistors, Black Gate electrolytics, and another silver wired transformer (output this time) complete the innards. 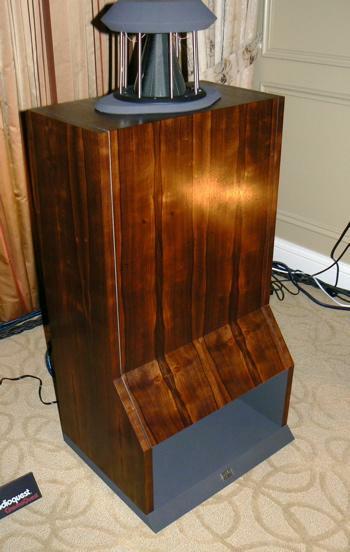 A new speaker from Vandersteen Audio doesn't happen very oftenRichard Vandersteen introduced his Model 2 in 1977 and the 2009 CES witnessed the debut of the Model 7, which, at $45,000/pair is the most expensive speaker ever from the frugal Mr. V.
Richard Vandersteen showed me the new midrange unit he designed for the Vandersteen 7. The cone is a sandwich of balsa wood between two carbon-fiber skins, the voice-coil is titanium, and most notably, there is almost nothing in the skeletal chassis that would obstruct the cone's rear-wave. Frank Cheng's Acoustic System International now produces LiveLine cabling. Combining acoustic resonator technology with super thin, solid-core wire, the cabling is composed of different segments that contain wires made from different metals that are ultimately soldered together at 850 degrees. The RCA interconnect costs $995 (length not stipulated in the press materials), XLR interconnect $1450, 1.8m power cable $995, and 2.4m speaker cable $1750. One online publication gave each of these cables a product of the year award. I walked into Balanced Audio Technology's room and almost couldn't leave. 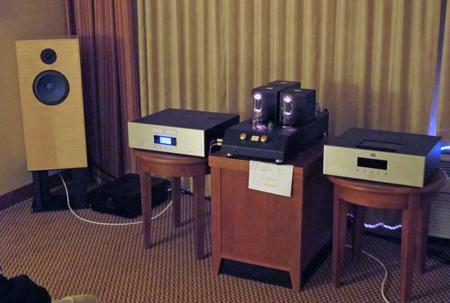 Geoff Poor was driving a pair of WATT/Puppy 8s wth an all BAT system consisting of a VK-D5SE/Superpack CD player ($9500), VK-32SE preamplifier ($8000), and the new 55Wpc VK-55SE amplifier ($5995). 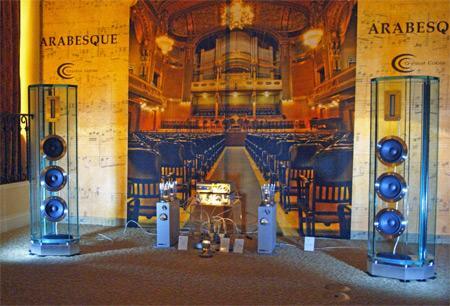 "Now that can't work," I thought, as I went into the Crystal Cable room and saw the Dutch company's new Arabesque loudspeaker (45,000 Euros/pair, equivalent to around $60,000). A glass enclosure? But as I listened to a variety of recordings that I thought would expose cabinet problems, such as female vocals and solo cello, I didn't hear any flaws that I could lay at the feet of the enclosure. 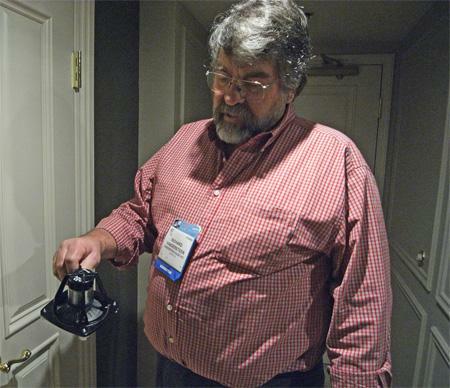 One of the most impressive speakers I have auditioned in the past few years was the three-way Aerial 20T, which was reviewed by Michael Fremer in April 2004. I spoke to Aerial's Michael Kelly a while back about getting a pair for a Follow-Up review, but he declined, saying that he was working on an improved version. 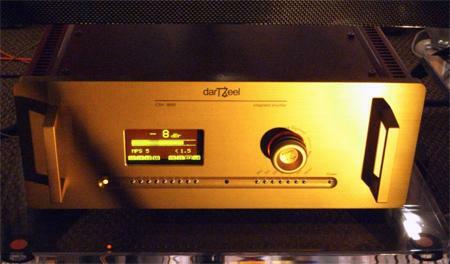 Magico had two rooms at the Venetian, the first of which featured the Californian company's new 4-way M5 ($89.000/pair). Weighing in at 360 lbs, the M5 features a ring-radiator tweeter built into the baffle, two 6" Nano-Tec-coned midrange units, and two 9" Nano-Tec woofers, these featuring 5" voice-coils. 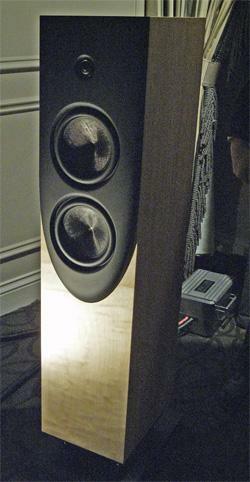 The sealed enclosureno ports in Alon Wolf's designsis constructed, like other Magico speakers, from multiple layers of Baltic Birch plywood. The convex front baffle is machined from a 200lb slab of aircraft-grade aluminum. 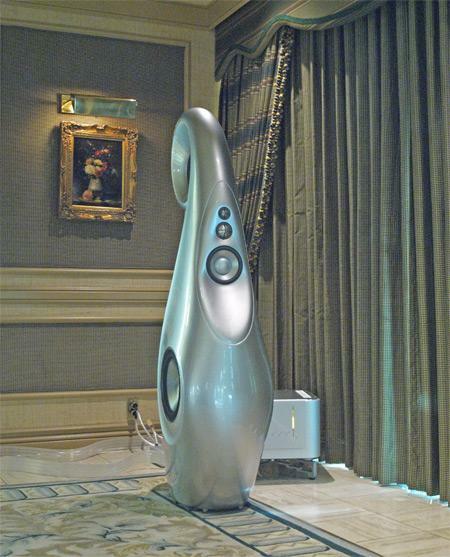 Featured in Magico's second room in the Venetian was the new V2 ($18,000/pair), a smaller sibling to the V3 that I reviewed last May. It combines the same ring-radiator tweeter as the V3 with two 7" Nano-Tec drivers, the latter arranged so that the lower woofer rolls off at a lower frequency than the upper one to give much of the sonic benefits of a two-way design. Over at the Boing Boing blog, it is customary to run a "unicorn chaser," an overly cute picture of a unicorn after posting a post that makes you go "eeeew." 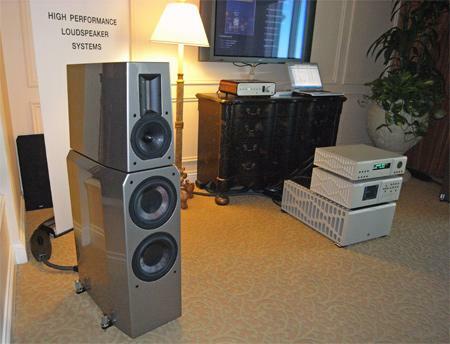 German Physiks Unicorn mk II ($21,500/pair) were sort of like that, only for show sound. Ahh, that's better.